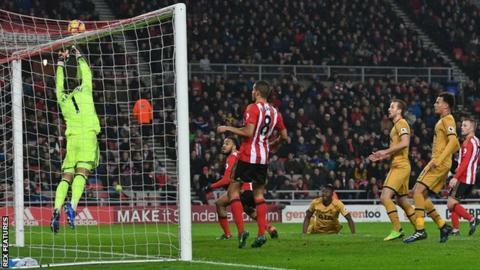 Title-chasing Tottenham had to settle for a point at the Stadium of Light as Sunderland climbed off the bottom of the table with a hard-fought draw. Spurs remain nine points behind leaders Chelsea after they were held by Liverpool, but this game will go down as a missed chance to close the gap. Mauricio Pochettino's side dominated possession against the Black Cats, seeing 73% of the ball, but could not make the breakthrough. Much of that was down to a determined defensive effort by the home side, but Victor Wanyama wasted Tottenham's best chance when he headed Son Heung-min's cross over the bar when unmarked at the back post. Sunderland only managed three shots, Fabio Borini firing straight at Michel Vorm from their only clear sight of goal. Tottenham had scored 16 goals in their previous five league games, but it was a lack of a cutting edge that cost them two points in the north east. Spurs managed only one shot at goal in the first 45 minutes, a Wanyama shot from 25 yards that Vitor Mannone pushed away at full stretch. They improved significantly after the break, with Kyle Walker and Dele Alli both seeing dangerous efforts deflected off target, but their only clear-cut chance saw Wanyama head wastefully over. An injury to Danny Rose, who was forced off before the break by a knee problem, only added to Tottenham's disappointment on a frustrating night. Pochettino's side are now unbeaten in 10 games in all competitions but this result represents a backwards step, despite a point that sees them climb to second place in the table. Much has been made of Sunderland boss David Moyes signing several of his ex-Everton players during the January transfer window but it was a duo returning from the Africa Cup of Nations who made the biggest impression for the Black Cats here. Along with Black Cats centre-back Lamine Kone, midfielder Didier Ndong has been away for most of January. Both players added much-needed energy and industry on their return, with Gabon international Ndong leading the Sunderland resistance with an all-action display in midfield. When Spurs got past him, they struggled to get past Kone too. The Ivory Coast defender made 15 clearances in total, more than any other player. Tottenham manager Mauricio Pochettino: "We are disappointed because I think we missed two points. "In the first half it was difficult for us to create chances, which was strange, but in the second half we played better and we had the chances to win the game. "It was not a good night for us but it is a good thing for us to learn that we need to play from the beginning of the game with the same aggression and attitude we showed in the second half." Sunderland manager David Moyes: "It was a really good point for us. We played against a top team and it was tough. We had to hang in there. "We made some chances in the first half but not many in the second, and it was a hard-worked and well-earned point. "Their pressure in the second half was hard to contain and the boys did a great job. They gave everything to get us a result." Former Liverpool midfielder Danny Murphy: "Tottenham are on a par with Chelsea in terms of their defence but I look at their bench and I don't see enough game changers there. "Chelsea can bring Pedro on Liverpool can bring Sturridge on and I look at Tottenham's bench and I just wonder if they have enough." Former England winger Trevor Sinclair: "It was shocking challenge by Jack Rodwell on Moussa Dembele. "We don't want to see this in the game, especially from a player who has had injury problems himself. "He just swipes at Dembele, it is a shocking challenge - he's nowhere near the ball. That could be a leg breaker. It warranted a red card for me." Sunderland kept only their third kept clean sheet of the season, with all three clean sheets coming at the Stadium of Light. Meanwhile, Spurs failed to score for only the third time all season in the Premier League. The Black Cats had only three shots all match - their joint-lowest total in a home Premier League game this season (along with Arsenal in October). Mauricio Pochettino has drawn four of his five visits to the Stadium of Light in the Premier League (W1). Only Chelsea (13) have kept more clean sheets than Spurs (10) in the Premier League this season. Jack Rodwell is still yet to win a Premier League game he has started for Sunderland (D17 L20). Tottenham are at home to Middlesbrough in the evening kick-off on Saturday (17:30 GMT). Sunderland travel to relegation rivals Crystal Palace earlier on the same day (15:00 GMT). Match ends, Sunderland 0, Tottenham Hotspur 0. Second Half ends, Sunderland 0, Tottenham Hotspur 0. Attempt missed. Eric Dier (Tottenham Hotspur) header from the right side of the box is too high. Assisted by Christian Eriksen with a cross following a corner. Corner, Tottenham Hotspur. Conceded by Sebastian Larsson. Foul by Vincent Janssen (Tottenham Hotspur). Attempt missed. Ben Davies (Tottenham Hotspur) left footed shot from outside the box is high and wide to the left. Assisted by Christian Eriksen. Substitution, Tottenham Hotspur. Vincent Janssen replaces Mousa Dembélé. Attempt saved. Christian Eriksen (Tottenham Hotspur) left footed shot from outside the box is saved in the bottom right corner. Assisted by Moussa Sissoko. Foul by Jason Denayer (Sunderland). Javier Manquillo (Sunderland) wins a free kick in the defensive half. Attempt missed. Victor Wanyama (Tottenham Hotspur) right footed shot from outside the box is too high. Offside, Tottenham Hotspur. Christian Eriksen tries a through ball, but Moussa Sissoko is caught offside. Substitution, Sunderland. George Honeyman replaces Fabio Borini. Corner, Tottenham Hotspur. Conceded by Billy Jones. Attempt blocked. Dele Alli (Tottenham Hotspur) left footed shot from the left side of the box is blocked. Attempt blocked. Dele Alli (Tottenham Hotspur) right footed shot from outside the box is blocked. Assisted by Victor Wanyama. Javier Manquillo (Sunderland) is shown the yellow card for a bad foul. Victor Wanyama (Tottenham Hotspur) wins a free kick on the right wing. Foul by Javier Manquillo (Sunderland). Attempt blocked. Son Heung-Min (Tottenham Hotspur) right footed shot from the left side of the box is blocked. Assisted by Mousa Dembélé. Corner, Tottenham Hotspur. Conceded by Lamine Koné. Attempt missed. Victor Wanyama (Tottenham Hotspur) header from the right side of the six yard box is just a bit too high. Assisted by Son Heung-Min with a cross following a corner. Attempt blocked. Eric Dier (Tottenham Hotspur) right footed shot from the left side of the six yard box is blocked. Corner, Tottenham Hotspur. Conceded by Javier Manquillo. Attempt blocked. Kyle Walker (Tottenham Hotspur) right footed shot from the right side of the box is blocked. Attempt saved. Christian Eriksen (Tottenham Hotspur) right footed shot from outside the box is saved in the centre of the goal. Corner, Tottenham Hotspur. Conceded by Jack Rodwell.